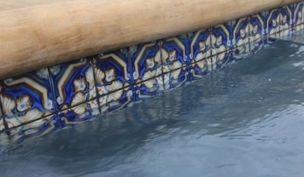 Adding impact to your pool or spa decor is easy through the use of patterned tiles. Through the elements of form, shape, line and color, patterns can give effects from subtle to dazzling. Preview a few different tiles here to see how dynamic patterns can be. The shade of tiles or stone may vary within any given color which is an inherent quality that enhances their beauty. All pool tiles are high fired porcelain or glass and colors can change with each die-lot. All the tiles we sell are made from high fired porcelain, which is the only type of tile that we recommended for pools, spas or water features. The difference between porcelain and other tiles is really one of quality rather than type. The clay used for porcelain tiles is simply purer and more refined, making them tougher, denser and more impervious to water. With a water absorption rate of less than 0.5%, porcelain tiles are less liable to stain and are usually more frost-resistant.